The fruit of angels is what Christopher Columbus called papaya. This tropical fruit that is native to Southern Mexico and Central America was exported to other subtropical areas of the World by the Spanish and Portuguese. Thanks to them papaya is now easy to find in many parts of the World. But it is Mexico, Puerto Rico and the American State of Hawaii the are currently the biggest producers and exporters of papaya. Papayas have a green outer skin when unripe and it transform into and orange-yellow colour when fully ripened. Depending on the variety it can be as long as 7 to 20 inches (or 18 to 50 centimetres) and they can weigh anywhere from one pound (half a kilo) to several pounds or kilos. The papayas grown in Hawaii tend to be smaller and rounder than the ones grown in Mexico, which are generally longer and weigh much more. A fresh and ready to eat papaya will have a strong scent that is sweet, tropical, and fruity — it really is a unique smell only to papayas. I believe that it is one of those fruits you either will love or not enjoy at all. The ones that are ready to eat immediately have orange skin, a fragrant smell and feel a little soft when touched, but make sure it isn’t too soft or mushy. Also choose ones without dark bruising. The papaya you see here is a Mexican variety and it is very much ripe and ready to eat. Of course you should watch the video above for clear visual instructions. As you can see it is very easy to peel with a knife (you could use a vegetable peeler but it is much quicker with a knife — just be careful not to cut yourself!) You’ll definitely get your hands messy with the juicy papaya pulp, but it’s so worth it. The tender reddish-orange flesh of the papaya is juicy and many people describe it as feeling similar to cutting into soft butter. Papaya seeds are edible and they can be saved and used for an array of things. Right out of the centre of the fruit they have a little gelatinous covering around them. You can easily squeeze between your fingers and reveal the seeds. They have a rough texture and their taste is a peppery one. As you can see in the video, I love a big squeeze of lime juice over my slices of juicy and soft papaya. The citrus and fruitiness of limes help to bring out some amazing flavours in papaya. They compliment each other perfectly. Additionally something I like to occasionally do when I eat papaya is add a sprinkling of sea salt over it. The combination of the sweet papaya flavours with the tart lime and saltiness is out of this world delicious — you must try it sometime! This is the most delicious way to eat papaya. Is Papaya Good For You? Papaya is loaded with antioxidants, Vitamin C, has a good amount of both Vitamin B and A. It is rich in folate, potassium, cooper, magnesium and dietary fibre. All of those great healthy qualities mean that papaya is good for your heart, helps in lowering inflammation (good for those with arthritis and rheumatoid arthritis), will help stabilise blood sugar levels (good for diabetics), helps improve your complexion and it will nourish your hair. Papaya is also very good for your digestive system as it helps to fight off parasitic worms. So what are you waiting for, go get yourself some papaya! P.S Let me know what you think of the video, and if you missed our first video click here to see watch! This is a wonderful post about papaya – and your photos are fantastic. You have a beautiful blog! Great information and so interesting…never knew the seeds were edible! I never knew how much I loved papaya – I used to only have it cooked, in an Asian dessert soup. I think the seeds scared me but then I got to trying it more and just love it. Great ingredient to spotlight. That is nearly about how I cut papaya. Only that my slices are thicker and dusted with a generous pinch of Chaat Masala (being Indian means you can’t help adding spices even to fruits!). Thanks for sharing the information about its benefits. Chaat masala on papaya sounds amazing, I’ll have to try that sometime. Thanks! Papaya is good stuff, isn’t it? Never knew it was called the fruit of angels, but that’s so appropriate! They sure are, I think you’ll quite enjoy the taste. Thank you Tandy and enjoy that papaya! 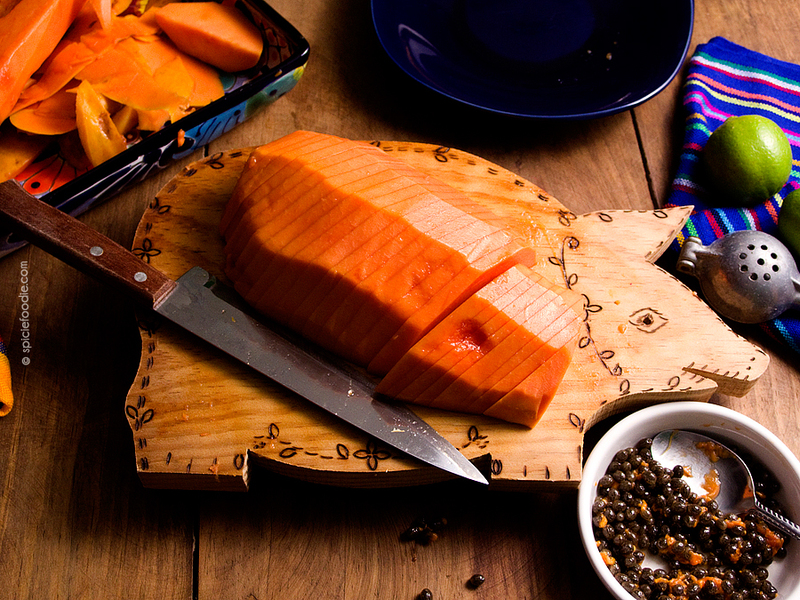 Papaya sure is the fruit of angels – so delicious! I love devouring it with just a sprinkling of sea salt. Great tips and tutorial, girlfriend! Cheers! Ah, always nice to meet a fellow fan of papaya. 🙂 Thank you Cheyanne! A good papaya is truly delicious. Too bad the quality is hit or miss when you buy them here in the US. And alas, even when you get lucky, their flavor doesn’t compare with when you try them in their native lands. I never knew the seeds were edible! I never thought twice about the seeds. How do you eat them?